Judge rules that plaintiffs can't be awarded top-level domains for Iran, Syria, or North Korea. 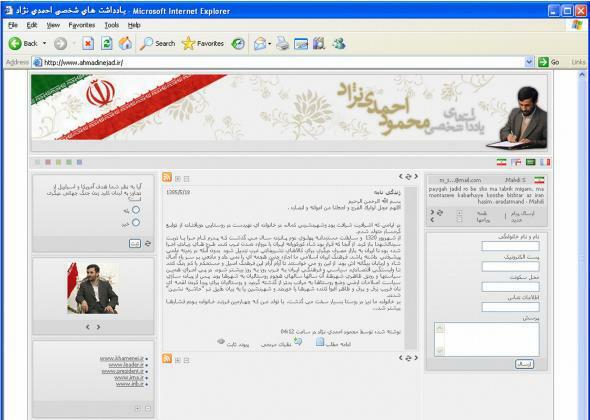 Ahmadinejad.ir, former Iranian President Mahmoud Ahmadinejad’s blog, in 2006. In Washington D.C., a federal judge ruled Monday that plaintiffs seeking Iran’s country code top-level domains (ccTLDs) as part of a damages award could not in fact take over the domains. The case began in 2001 following a 1997 suicide bombing in Jerusalem in which four Americans were injured. In Rubin et al v. Islamic Republic of Iran et al, the plaintiffs argued that the Iranian government could be held responsible for the attack since Hamas had taken credit for it, and Iran supported and continues to support the terrorist group. Surprising no one, Iran did not acknowledge the lawsuit, so the plaintiffs won the civil case automatically and in 2003 the court awarded them $109 million. You can see how it might be kind of difficult to get that $109 million from the Iranian government, though. So the plaintiffs have been working on tracking down Iranian assets that are in the United States. For example, as Ars Technica notes, they were able to get $400,000 from the sale of a Texas house that was owned by the former shah of Iran. Nothing else has panned out, though, so the plaintiffs decided to go after Iran’s top ccTLDs and, weirdly, Syria’s and North Korea’s, too. According to InTheCapital, the suit now stands more broadly for terrorist victims in all three countries. But the plaintiffs aren’t going to be able to seize the ccTLDs, .ir for Iran, .kp for North Korea, or .sy for Syria. The Internet Corporation for Assigned Names and Numbers, or ICANN, opposed the plaintiffs in their suit for control of the domains, and Judge Royce Lamberth agreed that top-level domains are part of the Internet’s broader organization system and aren’t something that can be dettached from that system and distributed. There, the court held that a domain could not be garnished by a judgment creditor under the relevant Virginia statute because it was “inextricably bound” to the domain name services provided by the registry operator. … The court further observed that allowing garnishment of a registry’s services as part of garnishing a right to a domain name would mean that “practically any service would be garnishable.” The court finds this reasoning persuasive as applied to District of Columbia attachment law as well. … A ccTLD, like a domain name, cannot be conceptualized apart from the services provided by these parties.